Zucchini and cheese pie (p. 245) was the first recipe I tried to make from Elaine Louie’s cookbook The Occasional Vegetarian (Hyperion, 2011), which is a collection of 100 recipes featured in her New York Times column. I’ll admit that what this recipe had going for it most was not that it sounded interesting so much as that it was relatively low-calorie compared to the other recipes I took note of in this book. I was originally going to do a full walk-through like I usually do, but in the end I simply don’t think it’s worth it. The recipe is “adapted from Louise Beylerian”, and said to come from the cultural stew of Cairo. It calls for a large quantity of zucchini, which is fried in olive oil, layered with chopped dill and shredded cheese in a pie plate, covered in an egg-enriched bechamel, and then baked. The recipe itself is not well-written: Louie calls for a “deep” pie plate, which was not required, and notably fails to call for broad, mature zucchini, which shortly into the prep process I decided she must have intended. I can’t tolerate mature zucchini and so never buy it, but it seems essential to this dish given the preparation instructions clearly indicate that only two batches of frying the eighth-inch zucchini slices should be necessary. 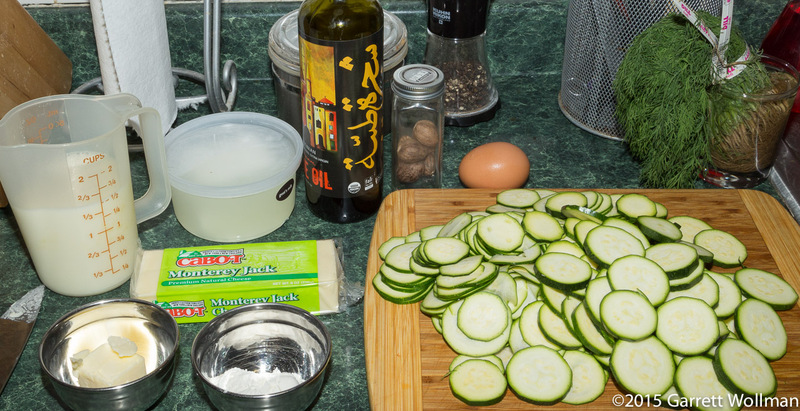 Since my zucchini was narrower, I had far more slices, and it took four batches — with more oil, even if it was extra-virgin olive oil, increasing the overall greasiness of the dish. That looks like a lot of zucchini, and it is, but it’s still two ounces short of the pound and a half the recipe calls for. (It was four edible-to-me-size zucchini.) I initially tried using my V-slicer to cut the required rounds from the (washed and trimmed) squash, but I found that neither of the settings on the slicer would produce an eighth-inch round. (With a proper mandoline, that would probably not have been an issue, so eventually I settled for uneven hand slices using my chef’s knife instead. After frying all the zucchini, half of it is spread in a lubricated pie plate, then topped with chopped fresh dill and two different cheeses: shredded Monterey Jack (I used Agri-MarkCabot but grated it myself) and crumbled feta (I used a goat’s-milk feta from Vermont Butter & Cheese). Then the rest of the zucchini goes on top, followed by dill, and then the pie sits there while you make a bechamel sauce. Louie calls for a very dark roux; I chickened out and added the milk after only five minutes of cooking — normally my bechamel uses a one- or two-minute roux. After thickening the sauce, it’s allowed to cool for just long enough to stir in a beaten egg without scrambling, although I still strained it, like a custard, to ensure that any small bits of overcooked egg are removed. The sauce goes on top, and then the whole thing is cooked for 45 minutes in a 375°F (190°C) oven. This whole process, from prep to finished pie, takes about twice as long as indicated in the recipe — almost exactly two hours for me, which was not what I needed for a workday meal. Overall impression? Not very good. The texture is terrible, and the flavor is not great either. Would not recommend — and the next time I’m looking to cook a vegetarian main dish, I’ll stick with one of Yotam Ottolenghi’s vegetable cookbooks: the recipes there are better specified and better written. 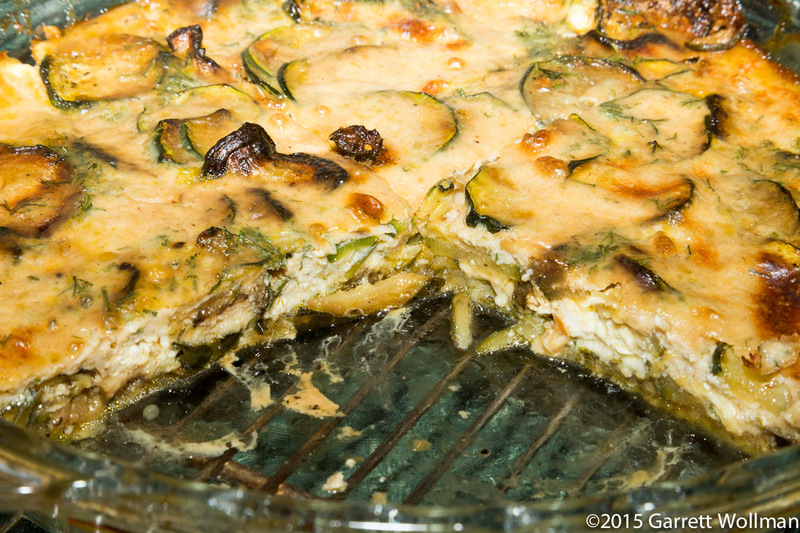 This entry was posted in Food and tagged Elaine Louie, recipe, vegetarian, zucchini. Bookmark the permalink.